Pianist Stephen Gosling is a ubiquitous presence on the New York new music scene, and has also performed throughout the U.S., Europe, Latin America and Asia. His playing has been hailed as “brilliant,” “electric,” and “luminous and poised” (New York Times), possessing “utter clarity and conviction” (Washington Post) and “extraordinary virtuosity” (Houston Chronicle). Mr. Gosling was pianist of the Aspen Contemporary Ensemble for three years, and appeared in several seasons of the Summer garden series at MOMA. He has also performed at the Kennedy Center in Washington, D.C., the Grant Park Festival in Chicago, the Bang on a Can Marathon, Bargemusic, the 2001 Great Day in New York festival, and the PAN festival in Seoul, Korea. He is a founding member of the American Modern Ensemble, as well as a member of Ensemble Sospeso and the New York New Music Ensemble. 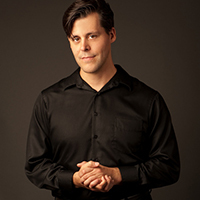 He has performed with Orpheus, the Chamber Music Society of Lincoln Center, Speculum Musicae, DaCapo Chamber Players, the Orchestra of St. Luke’s, Continuum, the League of Composers/ISCM Chamber Players, and Da Camera of Houston. He has also participated in Off-Broadway productions and collaborated with a number of dance companies, including American Ballet Theater and Parsons Dance Project. Mr. Gosling has been heard on the NPR, WNYC and WQXR radio networks, and has recorded for New World Records, CRI, Mode, Innova, Rattle Records and American Modern Recordings (AMR).